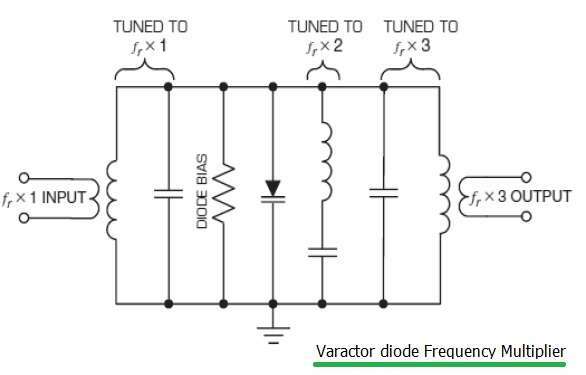 This varactor diode application note covers basic description on varactor diode as frequency multiplier and tuner. The circuit diagram is mentioned. Varactor diode is used as voltage dependent variable capacitor semiconductor device. It operates in reverse biased whose operation depends upon transition capacitance. Here P and N regions have high concentration of majority carriers and hence will have low resistance areas. Here space charge region or depletion region caused due to depletion of majority carriers act as dielectric. The P and N regions act as plates of capacitor. The depletion region mentioned acts as insulating dielectric layer. Refer Varactor diode basics and applications. Figure-1 depicts varactor diode symbol and varactor diode equivalent circuit. Transition capacitance in terms of reverse bias voltage (VR) is expressed as below. 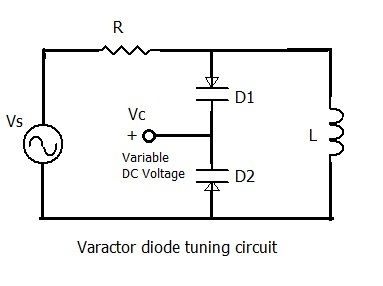 Figure-2 depicts varactor diode tuning circuit. In this circuit two diodes D1 and D2 provide total variable capacitances in a parallel resonant circuit. Here Vc is the variable DC control voltage which controls the reverse bias and consecutively capacitance of the diodes. L mentioned in the circuit is inductance in henrys. Diode frequency multipliers can be typically classified as Schottky barrier diode or varactor diode type. In the varactor diode type multiplier a nonlinear reactive element is used. Varactor reactive type multipliers have high potential conversion efficiency. It needs very low drive power levels but exhibit narrower bandwidth and high sensitivity to operating conditions. It also exhibit stability problems sometimes. Varactor diode frequency multipliers generate very little amplitude and phase noise. The only noise source is the thermal noise of the series resistance of the varactor diode and the circuit loss resistances. The power capability of a varactor multiplier is limited by breakdown of the device. The varactor diode has a parasitic resistance in series, which dissipates power. A varactor frequency multiplier is capable of higher efficiency and higher power than a resistive type frequency multiplier. Figure-3 depicts lumped element based frequency doubler and tripler. It is possible to dvelop frequency doubler using microstrip elements and varactor diode.